What is Therapeutic Harp Music? Therapeutic Harp Music is based on the science of sound. It is live, acoustic music played at the bedside of patients. The music helps provide an environment conducive to the healing process. Therapeutic Harp Music creates an atmosphere of peace and calm. The practitioner is able to play to the person’s needs and requirements. The music synchronises the brain and the listener is able to recall moments of pleasure and comfort. Therapeutic Harp Musicians use the music to speak for itself and have an effect on the listener. The music is offered as a non-invasive adjunct to medical care. Therapeutic Music is not entertainment nor is it the same as Music Therapy. The Harp has been considered a healing instrument since ancient times. 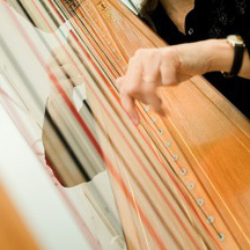 In the present day, the harp is increasingly being used within hospitals, aged cared and dementia facilities. 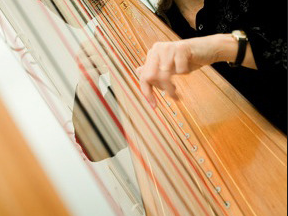 The music of the Harp creates a calming environment for patients, families, visitors and staff. The vibrations of the strings emanate from the harp, are absorbed by the body, and can be beneficial in many situations. The soothing sounds are of comfort to the dying, as hearing is the last faculty to go. Benefits of Live Harp Music. Playing familiar tunes can simulate the memory for dementia patients. The music has aided people to sing, even when they have lost the ability to speak. Allows for the release of emotions and grieving. Harp music brings about a sense of calm, inner peace and emotional balance. Anna Linky has been a wedding musician for over 40 years. These days her focus is mainly playing harp and singing for therapeutic situations. 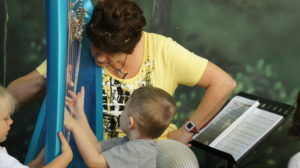 Anna Linky plays the harp on request as part of a hospital and home visitation. 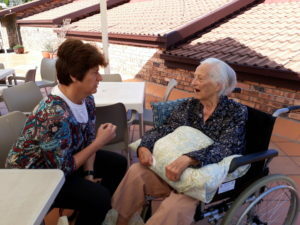 She does small concerts at care facilities for the residents and plays for weddings, anniversaries, birthdays and life celebrations of all kinds. 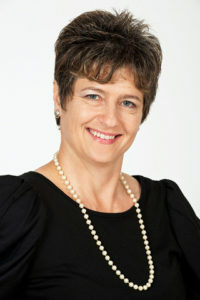 She is a Pastoral Carer and Life Coach, Certified Therapeutic Harp Practitioner with IHTP. Anna Commenced music studies in South Africa with piano, harp, and singing as her main instruments. She studied Music and Psychology at UNISA in South Africa while practicing as Professional Kinesiologist. She played mainly at weddings (solo and ensemble), celebrations of all kinds corporate and private for 40 years with some experience of Orchestral playing in South Africa and Australia. She has taught the harp in South Africa, Queensland Australia for over 20 years and has served on committees of the harp societies. 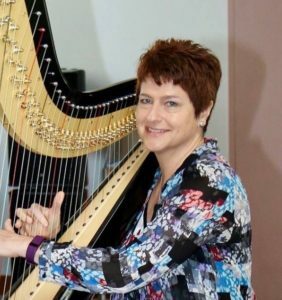 Currently on the founding committee, ATHA (Australian Therapeutic Harp Association). Over the years Anna formed a real interest in the effect of music in healing, but it was only in 2017 that this became a study field that would take her into the next level of Therapeutic Harp Music. Currently working at Full Care for Down Syndrome facilities, Aged Care and Hospice facilities as well as Pastoral care in the Melbourne, Geelong, and Torquay areas of Victoria, Australia as Certified Therapeutic Harp Practitioner (IHTP) since 2018. With a special interest in pastoral care, meditational improvisation, and teaching music to all ages but especially adults. “Music expresses the things that cannot be said and on which it is impossible to be silent.” Victor Hugo.